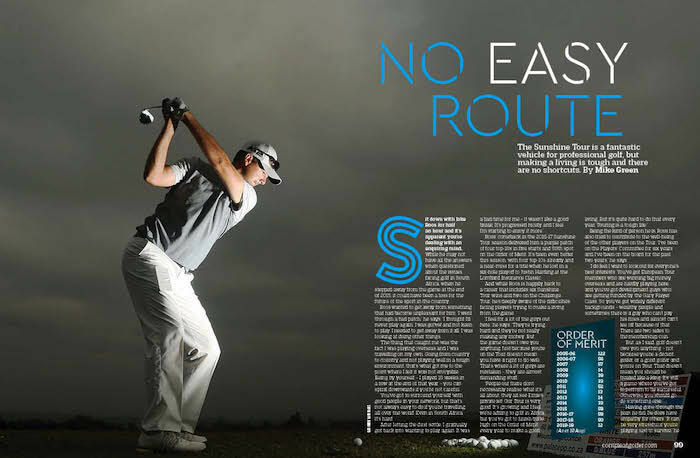 The Sunshine Tour is a fantastic vehicle for professional golf, but making a living is tough and there are no shortcuts just ask Jake Roos, writes MIKE GREEN in Compleat Golfer. Sit down with Roos for half an hour and it’s apparent you’re dealing with an enquiring mind. While he may not have all the answers when questioned about the issues facing golf in South Africa, when he stepped away from the game at the end of 2015, it could have been a loss for the future of the sport in the country. Roos wanted to get away from something that had become unpleasant for him. ‘I went through a bad patch,’ he says. ‘I thought I’d never play again. I was gatvol and not keen to play. I needed to get away from it all. I was looking at doing other things. ‘The thing that caught me was the fact I was playing overseas and I was travelling on my own. Going from country to country and not playing well in a tough environment, that’s what got me to the point where I felt it was not enjoyable. Being by yourself – I played 10 weeks in a row at the end of that year – you can spiral downwards if you’re not careful. ‘You’ve got to surround yourself with good people in your network, but that’s not always easy to do if you’re travelling all over the world. Even in South Africa, it’s hard. Roos’ comeback in the 2016-17 Sunshine Tour season delivered him a purple patch of four top-10s in five starts and 50th spot on the Order of Merit. It’s been even better this season, with four top-10s already and a near-miss for a title when he lost in a six-hole playoff to Justin Harding at the Lombard Insurance Classic. And while Roos is happily back to a career that includes six Sunshine Tour wins and two on the Challenge Tour, he’s deeply aware of the difficulties facing players trying to make a living from the game. ‘I feel for a lot of the guys out here,’ he says. ‘They’re trying hard and they’re not really making any money. But the game doesn’t owe you anything. Just because you’re on the Tour doesn’t mean you have a right to do well. That’s where a lot of guys are mistaken – they are almost demanding stuff. Being the kind of person he is, Roos has also tried to contribute to the well-being of the other players on the Tour. ‘I’ve been on the Players’ Committee for six years and I’ve been on the board for the past two years,’ he says. ‘I do feel I want to look out for everyone’s best interests. You’ve got European Tour members who are winning big money overseas and are hardly playing here, and you’ve got development guys who are getting funded by the Gary Player Class. So you’ve got widely different backgrounds – wealthy people and sometimes there is a guy who can’t pay his fines and almost can’t tee off because of that. There are two sides to the membership coin. Having gone through the pain he did, he does have empathy for others. ‘It can be very stressful if you’re playing just to survive,’ he says. ‘If you can play to contend and be in a position to win tournaments, it’s a lot easier because, no matter what happens, at the end of the week you’re still making money and keeping things ticking over. If you’re battling, every week you’re worrying about making money. Most guys go through that because there are a few guys who regularly contend. So, if he was in a position to change things, what would be do? ‘You have to try to increase the prize money,’ he says. ‘The winter events are great. It’s great for us to be able to play for R800 000 but, realistically, if you look at the number of players in those fields, probably 80% of them will make a loss. That makes it hard for a lot of people and it’s not really sustainable. If it happens week in and week out, it’s not going to add up to a good situation for the membership. ‘We need to increase value for the sponsors so that we can ask for better prize money. Maybe we have to create better brands among the players, or a stronger brand for the Tour. I think we’ve got enough events, but we’re going to have to push those winter tournaments above a million. We’ve got good events in the summer, but only half the membership get to play the really good ones. Having experienced what he did, would he risk testing himself abroad again? ‘I do expect to win again soon and I often ask myself whether I’ll go overseas again,’ he says. ‘You’ve got to believe you’re playing well enough to compete overseas, otherwise you might as well give up. I don’t think it’s good to only play locally. There’s a ceiling here, where you can only earn so much. There are many more opportunities overseas. ‘I do believe I can get there, but having a young family makes it tougher. So I’m also looking at some other options. I’m quite involved with the Tour; the other side of it interests me. But while you’re still playing, you’ve got to believe you can reach the next level. You can’t allow yourself to get complacent. Day by day would be good if he gets into the administration of the game.